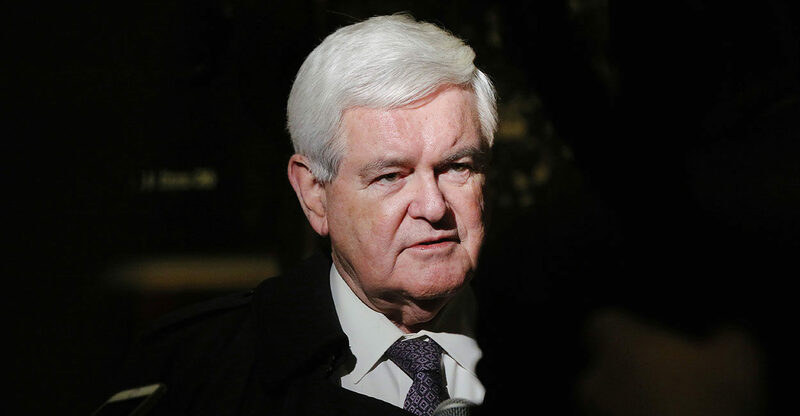 (The Daily Signal) – Former House Speaker Newt Gingrich spoke exclusively to The Daily Signal’s Ginny Montalbano about his new book “Trump’s America: The Truth About Our Nation’s Great Comeback.” The transcript has been edited lightly for clarity and style. Ginny Montalbano: Speaker Gingrich, thank you for being with us. I want to start with your new book, “Trump’s America.” In it, you discuss the achievements of the Trump administration. What are the president’s biggest successes so far? Newt Gingrich: Well, I think his biggest success has been getting the economy started again, with job growth and the lowest African-American unemployment in history. Remarkable breakthroughs. And I think his second-biggest achievement has been getting conservative judges approved by the Senate in steps that are really going to change the judiciary for the next 20 or 30 or 40 years. It’s a great achievement. Montalbano: You have a personal relationship with President Trump. What is he like behind the scenes? Gingrich: A lot like he’s like in front of the scenes. He’s very aggressive, very energetic. Has a good sense of humor. He has always got energy. He’s always pushing ideas. He listens very, very well. Asks good questions. But he’s also always kind of exploring what’s going to happen, and what are you hearing, and what do people think. Montalbano: What do you think about President Trump’s communication style? Gingrich: I think it is so totally unique that, other than maybe Andrew Jackson, I can’t think of any American president who would be anywhere close to President Trump in his ability. He understands the current culture, the current technology, and he is able to be at the center of the attention virtually every single day in a way that nobody else I know could sustain. Montalbano: What is the biggest misunderstanding that people have about the president? Gingrich: I think the biggest misunderstanding is that they think that at the margins he is a little bit wild, when he’s not. He’s very thoughtful. He has a style that at times has him do things, some of which frankly I don’t particularly like, but his underlying, long-term focus is remarkably stable and remarkably powerful. Montalbano: What grade would you give the media for their treatment of President Trump? Gingrich: Well, I think I’d give the media an A for absolute hostility and an F for accuracy. And, I think I would give them sort of a C for being silly. If you look at the stories that they think really matter, the president can do something heroic and historic, and some piece of junk will lead the news. That’s a sign of both the childishness of the modern media and of the extreme hostility they feel toward President Trump. Montalbano: What has surprised you most about the Trump presidency? Gingrich: His calm, steady ability to just keep moving forward, no matter how often he gets hit. I think he takes an enormous beating from the news media. One recent study said 91 percent of the coverage was negative, and yet he gets up every morning and he has not blinked, he has not backed up. He’s not diverted from his course. He has steadily moved where he thinks the country wants him to go, and it’s an amazing achievement. Montalbano: You write about the anti-Trump coalition. Who is leading this opposition, and how can President Trump protect his agenda? Gingrich: Well, I think probably you have to say part of the leadership is the elite media. Part of it is the left-wing Democrats. Part of it is the Hollywood liberal crowd. Part of it is academic professors. But what Trump has to do is what he’s doing. Stay focused on the big ideas. Keep moving forward. Create jobs. Improve government. Decentralize away from Washington. Keep your word. Stand solid for conservative values. If he just keeps doing his job, he’s going to get stronger and stronger. Montalbano: You recently called the Justice Department’s actions regarding the Trump campaign “the biggest and most sobering political scandal in American history.” Can you expand on why you think that? Gingrich: When you realize that the No. 1 leader of the FBI [and] the No. 2 leader of the FBI both clearly broke the law, when you realize that there was a systematic effort to cover up for the Clintons with immunity being given to people, with all sorts of weird things going on, and then you look at how viciously they went after the Trump supporters, you have to conclude that this was the greatest abuse of bureaucratic power at any point in the history of the deep state. And that had [Hillary] Clinton won, they would have covered the whole thing up, and we would be living in a country with a very corrupted Justice Department or a very corrupted Federal Bureau of Investigation. So I feel doubly grateful that Trump won, because I think the danger of Clinton would have been so horrendous. Montalbano: You’re a historian. When the history books look back at this period, what do you think they will focus on, and is there another period of time you think is similar to the one we’re in right now? Gingrich: I think that the process with Andrew Jackson in the 1820s, early 1830s, was similar. I think that to some extent Lincoln and the Civil War was similar. To some extent, Franklin Delano Roosevelt, during the Great Depression, was similar. But I think Trump is unique. It’s a unique moment in time, and I think we’ll see, but my sense now is he’s beginning to win. People have begun to recognize how effective he is. And if the economy keeps growing, unemployment keeps dropping, [and] we can avoid a major war in Korea or Iran, I think President Trump will almost certainly get re-elected. Montalbano: Speaking of the economy, something very successful to come out of this administration has been tax reform. Have there been any particular stories about people benefiting from tax reform that have inspired you? Gingrich: I’ve talked to people who literally … the tax break they got allowed them to help send their child to college. It allowed them to go on vacation. It allowed them to pay off debts. You talk to everyday working Americans, and the amount of money that Nancy Pelosi thought was peanuts they thought was a real advantage to making their lives better. Montalbano: You mentioned President Trump is facing multiple foreign policy challenges, from China to North Korea to Iran. How do you assess his performance on the global stage? Gingrich: I think so far it’s been extraordinary. I mean, I’d probably give him an A+. He has served notice that America’s back, that we are going to look after American interests, that we want to work with our allies, but we want to work with [them] on mutually beneficial terms. That we are not going to tolerate our enemies doing things that other presidents would have put up with. I think he’s so far done a remarkable job. And he’s assembled, with Secretary of Defense [James] Mattis, Secretary of State [Mike] Pompeo, national security adviser [John] Bolton, a very strong, very tough-minded group. Montalbano: What qualities should conservatives be looking for in the next speaker of the House? Gingrich: Well, the No. 1 quality for speaker of the House has to be to unify the party and get to 218 votes. It should be somebody who is conservative. Somebody who is sympathetic to the Freedom Caucus, but also somebody who can sit down with moderate Republicans and find a way to get everybody in the same tent. Montalbano: President Trump has referred to the Russia investigation at times as a witch hunt. How can we hold the media accountable? Gingrich: I think that the president does a pretty good job of it, and I think people are increasingly aware of it. If you look at the polling data, there’s been a dramatic decline in people willing to believe the news media, and the concept of fake news has gained momentum for the last year and a half. So I do think we’re gradually moving towards some serious self-corrections, and you may have a more practical and more conservative news media two or three years from now. Montalbano: You recently explored Robert F. Kennedy’s 1968 presidential campaign for your Facebook series “What if? History That Could Have Been.” The 50th anniversary of Bobby Kennedy’s assassination is June 5. Could you tell us what the goal is for your Facebook series, and the lessons you learned from studying that campaign? Gingrich: I think that the reality was that Bobby Kennedy probably was not going to be nominated. I think Hubert Humphrey was probably going to be nominated. But it was a fascinating period, a tragic period. Having lost his brother in 1963 and then having lost Martin Luther King Jr. that spring. Montalbano: May 25 marked the anniversary of President John F. Kennedy setting the goal of having an American on the moon by the end of the ’60s. President Trump has also voiced an interest in space exploration, and you have as well. What is the importance of space exploration? Gingrich: First of all, space is vitally important to us, because it’s how we break out beyond the planet. It increases the chance of our surviving as a species dramatically. Somebody’s going to do it, and I would rather it be an American who does it in the name of freedom than somebody from China who does it in the name of dictatorship. And, my hope is that President Trump and Vice President Pence are going to lead a very aggressive effort to move America into space. Montalbano: In your book, you mention that there is not going to be a compromise between the Trump administration and the anti-Trump coalition. If you could give President Trump some advice right now, what would that be? Gingrich: You know, I think the No. 1 job President Trump has is to remain Trump. … Whether it’s golfing or whatever it is that enables him to relax and be Trump, he is a unique character. He is undertaking an enormous mission. He is moving the country. By moving the country, he’s moving the whole human race. He’s doing things that I’ve never seen any other president do. I think the most important thing for him, for the next seven years, is to continue to be Donald J. Trump. Not allow the Washington bureaucracy or the Georgetown social set or the news media or anybody else to soft soap him into giving up the core values that have made him so unique. Montalbano: Speaker Gingrich, thank you very much.